You can still bid on one of our 100 silent auction prizes --- with or without tickets! -- Support a great cause! Tickets are sold out. With or without tickets, you can still bid on one of our 100 silent auction prizes! For volunteers already scheduled to be working at this event ------ To off-set food costs that Bear Creek Services incurs for each person in attendance, we ask that you purchase a reduced $20 ticket. We appreciation your support for Bear Creek Services! This non-ticket is an option to make a charitable contribution to Bear Creek Services. Disability services in Minnesota were recently hit with a 7% funding cut from the State of Minnesota. The cut has been very painful as we continue to provide the same support services for the 100+ people who have disabilities and traumatic brain injuries in our community. Any additional donation you can make really helps. Thank you! Admission for 1 person to Wines of the World on March 1, 2019 at the Rochester International Event Center. 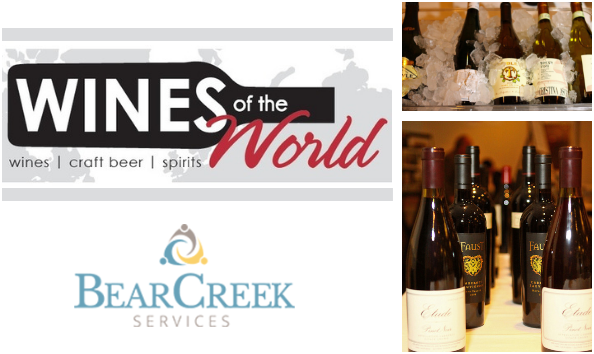 Description: Wines of the World is a fundraiser for Bear Creek Services; a nonprofit organization that provides support services for individuals who have developmental disabilities and traumatic brain injuries.